There is an old saying, which you probably all are familiar, which goes &apos;When life gives you lemons, make lemonade&apos;. I&apos;m thinking of starting a new one that says &apos;When life gives you 1.5kg of clementines, freak out, Google, and ask The Oracle, that is Twitter, what the hell you should do with them&apos;. One suggestion that really stood out (as well the idea of making a clementine sauce for desserts, which is next on my food hit list) was preserving slices of clementine in sweet sugar syrup (Thanks Susan!). 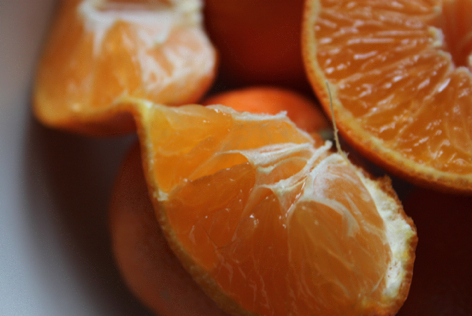 The uses for them then looked endless from my clementine tunnel vision point of view. Unlike some preserved fruit, theses arent heavy. Or too boozy. Instead they boast a cleansing, freshness that is often sought around this time of year. 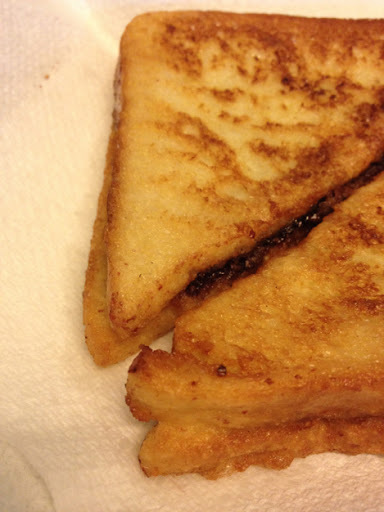 I love how they glisten, fat from sugar syrup. 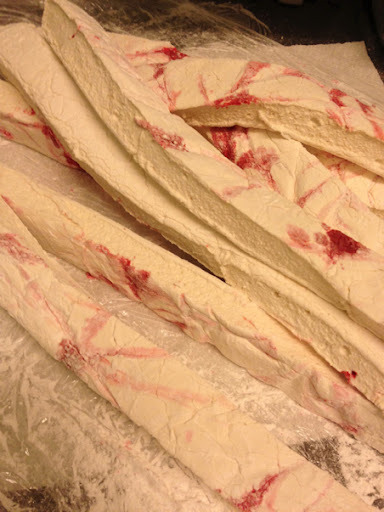 You can also preserve them whole, Kavey from Kavey Eats posted a delicious looking photo of her whole ones on Twitter. 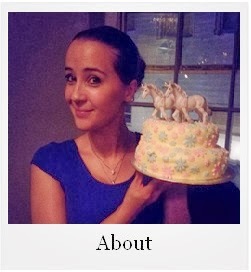 I suggest you go and have a good look (and good dribble) over her blog. 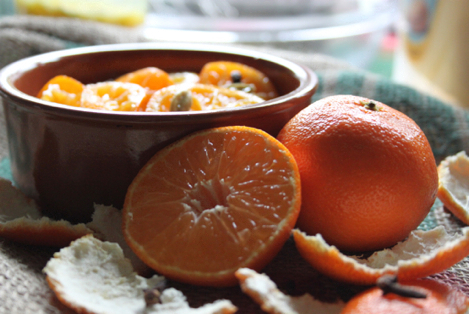 1, Cut the tops and bottoms off the clementines and discard the ends. 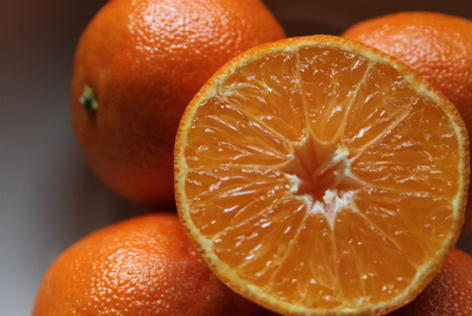 Cut each clementine into three or four thick slices and set aside. 2, Set a medium sized saucepan over a medium heat and add in the honey and sugar. Add in 250ml of water and stir to dissolve the sugar. 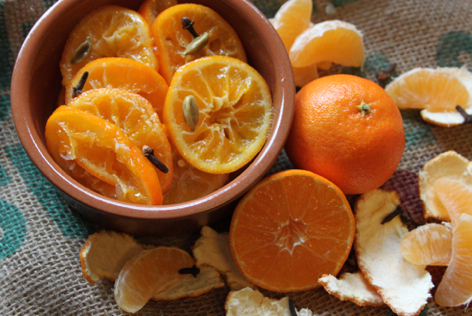 3, When the sugar has dissolved, gently slide in the clementines and increase the heat to a boil. Try not to poke around too much as they are quite fragile. Pop in the cardamom pods, cloves and triple sec. 4, Lower the heat a little and simmer for 10-15minutes. 6, Fish out the cloves and cardamom and discard. 7, Decant into sterilised jars and use within three months. 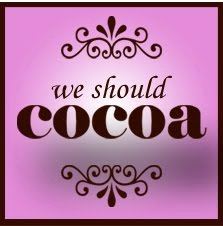 This month We Should Cocoa is hosted by Choclette from Chocolate Log Blog and she has picked orange as the special ingredient. You can see the gorgeous apple round up here. I think I&apos;m with the majority of associating orange and chocolate with that British classic, a Terry&apos;s chocolate orange. Not a year goes past where one isnt snuck into the house or attempted to be flogged by the side of a till when you&apos;re doing your Christmas shopping. Christmas just wouldn&apos;t be Christmas without one. I&apos;ve loved reading some peoples memories associated with them .And if you can eat and entire one in under 2 mins 39.5 seconds, you should call the world record people. As well as making marshmallows, I also made some delicious fudge as I had my sugar thermometer out. However, there wasn&apos;t much fudge left after "quality control" took place. 1, Place all the ingredients, except the orange zest, chocolate and sprinkles, in a large heavy based saucepan and place over a medium heat. 4, Add in the orange zest and start beating the fudge with a wooden spoon until it looses it&apos;s shine and thickens up. 5, Transfer the fudge to an 18cm square tin that has either been lined with cling film or sprayed lightly with cake release. 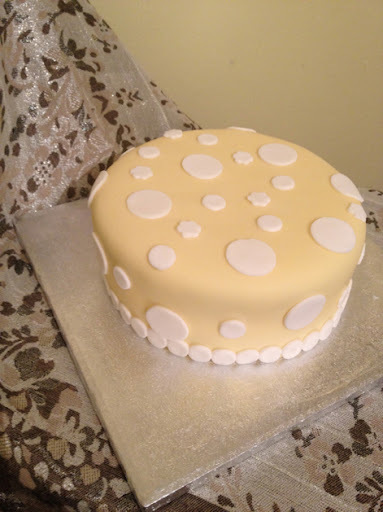 I used a silicone cake tin that I had spritzed very lightly with oil. 6, Smooth the top with a damp spoon and leave to set in a cool place. 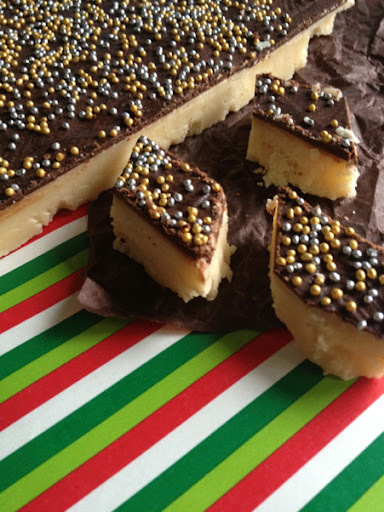 7, When your fudge has set, melt the chocolate and spread across the fudge. Sprinkle with some festive sprinkles and cut. So for the past 4 years, I've lightened the load and made small bags of edible goodies for those who would inevitably miss out on a card due to my sheer tardiness. I've done popcorn, truffles, gingerbread, biscotti, meringue, macarons and cookies in the past but anything small, that keeps relatively well can be bagged. 1, Put the water and gelatine into the bowl of your stand mixer and leave to sponge while you make your sugar syrup. 7, Beat until it goes white and fluffy and is the consistency of sticky bubblegum. This can take up a good few minutes and wont look very promising in the beginning but it will fluff up. 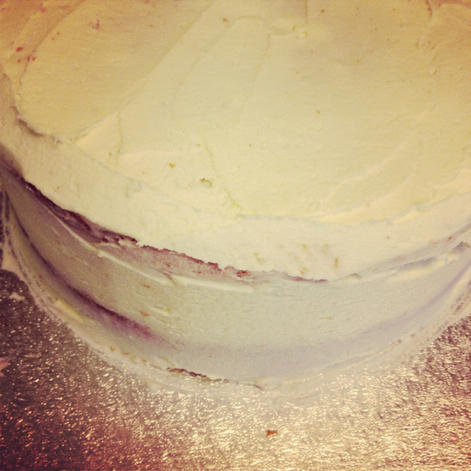 8, Whilst its beating, line an 10 inch square cake tin with greaseproof paper. Brush that lightly with vegetable oil and then dust with a little cornflour and icing sugar. Make sure you oil up the sides and dust those also. 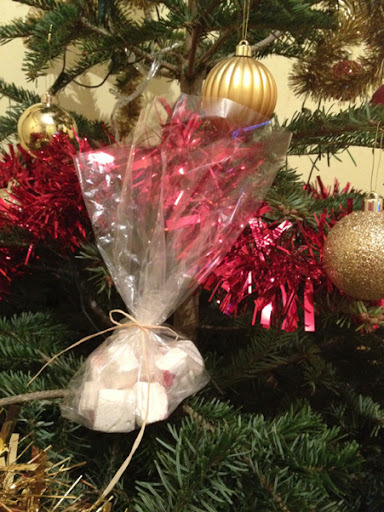 9, When the marshmallow is ready, it will take on the consistency of really sticky bubblegum, beat in your peppermint extract, carefully pour it into the prepared tin. At this point you can drip on a couple of drops of red food colouring and swirl with a cocktail stick but that's entirely up to you. Leave for a little bit to dry before sifting a little more icing sugar. But you want to hear something that is special? The smell of this cooking that fills you&apos;re house. Christmas in jar format. Plus, I wouldnt reserve this solely for mince pies... I have big plans for my jars of Christmas. One massive cooking apple, or two small ones, cored and chopped finely. 40ml rum, plus 25ml for adding before sealing the jars. 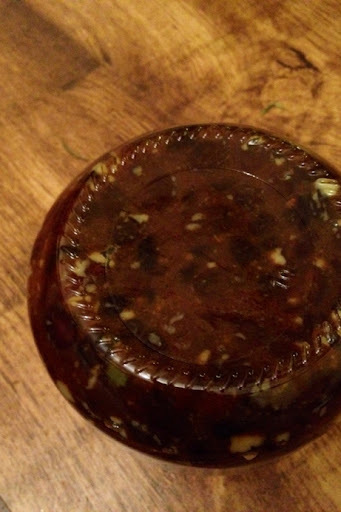 1, In a large casserole dish, combine everything together and stir well, slap on the lid. Leave this for 12-18 hours in a cool place. Top of a double oven is great, not the fridge though. 2, When you&apos;re ready to go, take off the lid, stir it and cover loosely with foil. Put into your cold oven and turn the heat to 120o/c and leave for three hours. 3, After three hours, remove from the oven. Before you lift the lid, imagine that everything inside has actually been to a swanky spa and is currently indulging in a new liquid fat swimming regime. This is normal. Lift the lid and give it a stir. And leave to cool. 4, Pack into sterilised jars and add a little more rum on top. We also recently did put up some of our Christmas decorations. 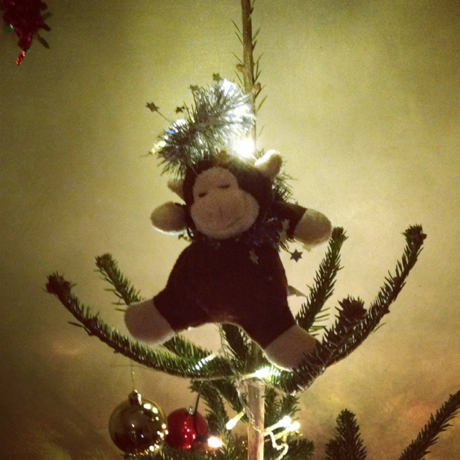 This is out Christmas monkey. 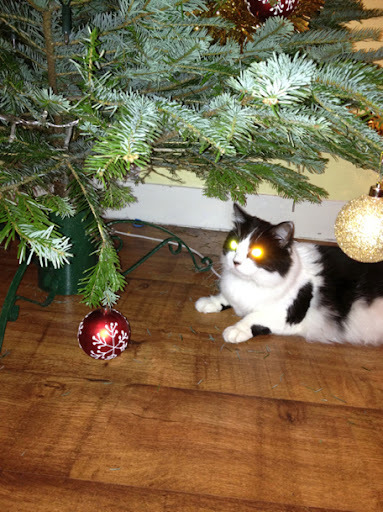 Luci turns into a robot every time baubles are involved in her life... "Must. Kill. Baubles." 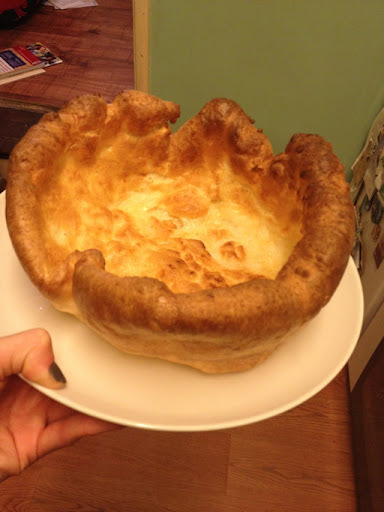 There are some days when you just feel the urge to make a Yorkshire pudding so big you could use it to either sail the English Channel or put your entire dinner in it and still have room to host a music festival. 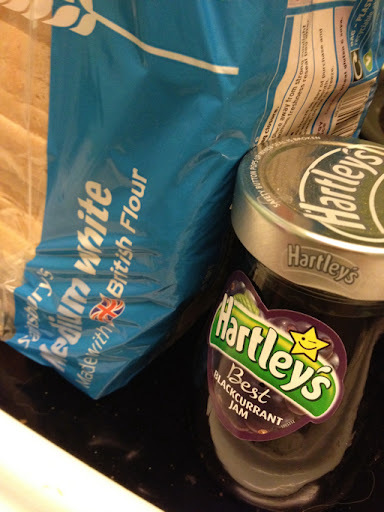 You will need 3 eggs (for two gargantuan Yorkshire puddings) flour and milk. In a measuring jug, crack in your eggs. This recipe is done on ratios and since eggs vary in weight and size, volume is the key. Measure how many millilitres or fluid ounces, then add the same amount of milk, and the tip the same volume of flour on it too. Transfer to bowl, and whisk until smooth and season to taste. Pop this into the fridge. Acquire two eight inch sandwich cake tins, and pour in 3tbsp of vegetable oil into each. Put straight into your cold oven and crank the heat up to 230o/c. When the oven has finished preheating, leave them for five minutes so the tins and oil gets very hot. When your ready to go, pour equal amounts of the batter into each tin. It will sizzle and may spit so do be careful. Bake for 15 minutes until they are evenly golden brown and well risen. Hot pan, hot oven, hot oil is the key for these. Marvel at your handy work. Impress people with your Yorkshire pudding skills.